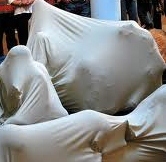 It was the realization that I will never win the battle against the dreaded fitted sheet. Generations of women in my family have successfully bested it. See? They don't even have to look at it. And this is the glorious end result. So, in order to maintain some semblance of order in the linen closet, my new strategy is to straight up hide my folding deficiency. Step One: Neatly fold the flat sheet. 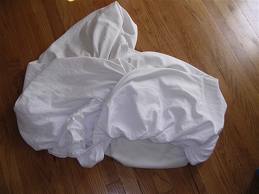 Step Two: Wad up the fitted sheet as seen above. Step Three: Place the wadded up sheet in the center of the folded one and neatly fold in half. Step Four: Place on shelf and hope no one ever notices. In the event that someone does notice, strongly consider lying and say the kids were helping with the laundry. First the update - Gabe started school this week and he loves it. I'm very glad we decided to "red shirt" him and let him wait the extra year. It made a big difference. He is not intimidated by any of the new changes, and he's just been going with the flow. yay! Sorry! It's been awhile since the last blog post. Here is the latest update. The boys are rotten as usual. This never changes. I'm finishing my bachelor's degree online, Craig just started a new job closer to home with a little higher pay (yay! ), and we're hoping to get family pictures taken within the next month or so. Cooper's MRI at Children's is also this week, so we'll be updating as soon as we get some info from that. Until then here was the rundown from our Saturday. It was a glorious family day! We all slept in, then packed up and went to play at a new park about 15 minutes away, had a picnic, then came home. The boys took naps, we had breakfast for dinner...... or "brinner", and then the boys played in their bouncy house in the backyard. Then they found the hose and made themselves a mud puddle and played in it for awhile. After that Daddy hosed them off and they hung up the bird house and feeder Daddy helped them build and paint the day before. Then........... baths! And I still managed to squeeze in a few loads of laundry into that day, some tv time with Craig, some homework, and a run! world and one dab of mean. 'cause that's who you got to ask if you want to sleep over at your friends. 4. Moms have magic, they make you feel better without medicine..
and anyone else who has anything to do with kids or just needs a good laugh!!! Today was Cooper's 2nd birthday! Yay! I pulled his smiling little self out of bed this morning and remembered that morning 2 years ago when we were in the car driving up to meet him. And when I said "Happy birthday Cooper Reed!" it made me remember how we thought we had time to pick his middle name out, and were informed right before he was born that it had to be on all the official paperwork from that moment on, lol. I remembered how I was the first person that got to hold him on his very first birthday - a gift from his birthmother that I will never forget. I did a lot of remembering in that moment this morning. :) And I love that both of our boys have such special birthday stories. So different, but each just as wonderful. He had a birthday party late this afternoon, with some family and family friends. My mom used skype so that she and my sister could watch him blow out his candles from 5 and half hours away. It was pretty cool. Yes, the cake is store bought. I ran out of time and energy........... and the oven is broken. I put the candles on it though! It was actually pretty tasty. Anyway, he liked his cake and ice cream, and he liked his presents. He got a training potty, some clothes, some books, some of the bigger sized duplo legos (so he'll quit stealing Gabe's and scaring me), some color wonder paper and markers (which he took a break from opening presents to play with - he loves to color), he got some puzzles, and a train, and a monster truck. AND.... drumroll please.......... he and Gabe got a bouncy castle from their great aunt! As you can imagine, it was a big hit at the party! It was a gorgeous day to be outside, and we have tons of pictures, and Coop had a blast. We topped our day off with a walk in the stroller and an early bedtime. The only slightly bad thing I have to say about this day is................ I'm exhausted! But happy!